What’s in Your Bottle of Olive Oil? Take a stroll down the olive oil aisle of your local grocery store. You may notice a lot of different bottle sizes, prices, colors and labels, but most of the ingredient lists will look fairly similar (ex. “Contains: Extra Virgin Olive Oil”). American consumers have been told for a while now that olive oil is “good for you,” and most have no reason to believe otherwise. If it says “olive oil,” it must be healthy — right? The reality is that the standards that regulate olive oil production are very loose; nearly 70% of what you’ll find on the shelves today should not even be considered extra virgin olive oil. If you use olive oil because it’s “better for you” than the alternatives, think again — unless you know how to read labels, you could end up with a bottle of “olive oil” that has no more health benefits than your standard cooking oil. At Vrisi 36, we want to keep our olive oil the way it should be — healthy, pure, untouched, unheated, unrefined, and completely natural. We can achieve this because we are not a commodity driven oil. Unlike other manufacturers that purchase, store and blend oils from around the world into one bottle, our olive oil is bottled fresh at the source from the country that produces the highest percentage of naturally-occurring extra virgin olive oil. Because we’re “One Country of Origin” (Greece, where it all began!) our olive oil offers high levels of healthy polyphenols and some of the best flavor profiles in the world. You might notice our products look, taste and even act a little differently than others on the shelves today. For example, our extra virgin olive oil is a little cloudy in color and may contain olive sediment. This is thanks to a one-paper filtration process — no chemicals — just enough filtering to sort out extra organic material. They may seem like small differences, but they’re actually huge — there is a difference between our Greek olive oils and most of what you’ll see in stores today! Extra virgin olive oil (or EVOO) is a term that gets thrown around a lot these days, but what does it actually mean? Simply put, olive oil that is extra virgin was pressed, and more specifically, first cold pressed. Absolutely no heat, chemical solvents or blending involved. EVOO is considered the highest grade of olive oil available, and it’s the only way we know how to make ours at Vrisi 36. The above definition of “extra virgin” is ideal, but unfortunately, not the standard the US follows. The FDA states that for an olive oil to be considered extra virgin, it must have less than .10 percent acidity, be derived from fruit, and basically, be edible. This means that much of the “EVOO” you’ll find on the shelf possibly barely passes the test, offering less than appetizing flavor with questionable health benefits. Even refined and blended olive oils can be legally declared extra virgin. Greece maintains many of the same olive oil production principles it did thousands of years ago — and we didn’t see a reason to change a thing. Vrisi 36 olive oil is not only imported from Greece, but produced from Greek olives in Greek pressing houses to ensure an authentic product. Greece produces more than 430,000 tons of olive oil annually, and more than 75% of that is extra virgin olive oil. This oil is naturally produced as extra virgin — nothing has to be done to it, as long as it’s kept fresh. Even the Italians know a good thing when they see it — many Italian manufacturers import Greek olive oil and blend it with their own oil! 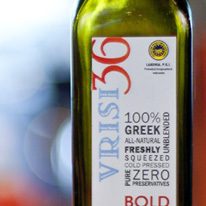 Vrisi 36 olive oil is made without any refining, blending or chemical filtration. This means that our EVOO has naturally achieved a low acidity level, a signal of quality and purity. What’s more, we didn’t feel the need to add anything to our olive oil to make it taste good or look good. We think it’s pretty great the way it is. When we say our olive oil is organic, we mean that the olives used to make it were grown by certified organic farmers. In Greece, organic certification is governed by a handful of EU-approved organizations who set strict standards, in partnership with the USDA, for organic farming. This means that our organic olive oil is just that — 100% USDA certified organic. For more information, please contact Flying Olive Farms. As a consumer, it's important to know that not every olive oil is created equal — just because it's olive oil doesn't mean it's good for you. Become an olive oil label reading expert with our help! 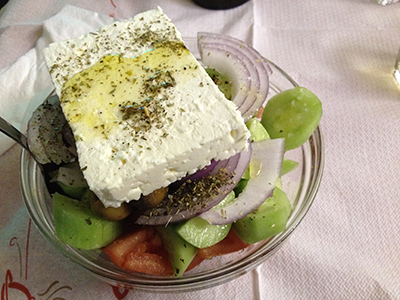 Greek vs. domestic olive oil — what's the difference? Vrisi 36 is 100% Greek, and for good reason. Greece is where it all began! Find out about our products are made, from farm to bottle.